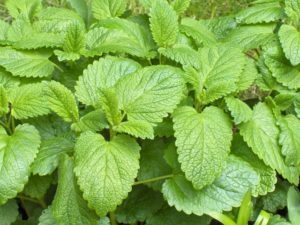 One of the more fresh and wonderful summer herbs that grows in one’s garden is Melissa, otherwise known as lemon balm. It has a light and lemony scent that attracts bees and the honey that is produced from melissa pollen is very distinct. In Greek, melissa means “bees/honey” and it was one of the earliest known medicinal herbs. Paracelsus called it the “Elixir of Life” because of its therapeutic qualities. The ancients would use it for ailments of the heart and nervous system, where emotions played a large part in the disease. Steam distilled from the Melissa officinalis plant, this herb is found mostly around the Mediterranean region, England and Ireland. Because of its tonic effect, Melissa is very helpful for disorders where nervous tension compromises organs like the heart or digestive tract. When nerves get jangled, a person can experience heart palpitations, panic attacks, hysteria and melancholy. Blood pressure might rise and hypertension may ensue. Massaging with melissa in a base carrier oil can soothe spasming in smooth muscle, thus relieving stress in the heart muscle. Its sedative qualities help to lower blood pressure and strengthen the heart tissue. Tension also plays havoc with the digestive system. Indigestion, nausea, vomiting and loose bowels can be some of the effects of a nervous tummy. Melissa, with its calming and nurturing effect can sooth jangled nerves and brings a state of tranquility and peace to the person. Once the nerves are settled, other emotions such as joy and amusement can enter. Melissa is very uplifting and rejuvenating. The female reproductive system also benefits from melissa’s tonic qualities. This essential oil, when massaged onto the belly, can relieve menstrual cramps and spasms. It allows the juices to flow, so to speak, by relaxing the tension through these organs. It has been known to help regulate ovulation, and therefore can be very helpful when pregnancy is a challenge. Melissa is helpful for bee stings, insect bites and in cases of skin rash. It should be diluted in a carrier oil as it can burn the skin when used neat. But one drop of essential oil, added to a skin cream or face wash can relieve the irritation of eczema and reduce inflammation. This oil also known to induce a slight perspiration and therefore can be very useful in reducing fevers and relieving headaches caused by a reaction to the summer heat or by a heated argument. Hotheaded emotions are balanced and tensions lowered when Melissa is used in an aroma lamp or when used in a bath (but remember to use only a little because of the possible skin irritation.) Joy and merriment replace stress and anger when this Jovian oil is around. So maybe Paracelsus was right when he suggested Melissa was an elixir of life. It certainly soothes emotions that can cause disease and discomfort in the body.